Structured around a set of brand-new works and around the eponymous film, the exhibition interconnects sacred spaces, animistic beliefs and scientific theories. Each of these works concerns imperceptible and yet active phenomena that have in common the real or supposed effects of electromagnetic waves, vibrations and frequencies. Continuing his exploration of the forms of political and scientific power, Laurent Grasso proposes new research into the power of waves, a matter which, although invisible, has tangible effects. The space of the gallery is bathed in frequencies emitted by hybrid and active sculptures whose electromagnetic activity can potentially act on the visitor’s body and mind. A Steiner machine, spiral sculptures with hypnotic forms, glass spheres featuring conductive paintings gravitate around the new film OttO, shown here for the first time in France. 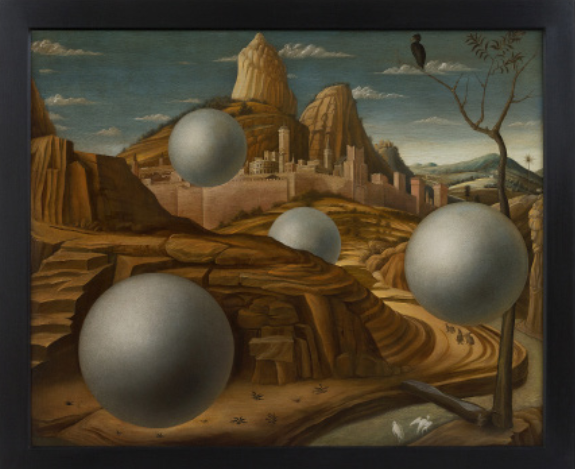 In this work the artist continues his attempt to represent the immaterial and his research into aesthetic, fictional and poetic variations produced on the basis of scientific utopias, theories or mythologies. Laurent Grasso, in an interview with Philippe Peltier, General Heritage Curator, Head of the Oceania-Insulindia Collections Heritage Unit at the Musée du Quai Branly -Jacques Chirac. 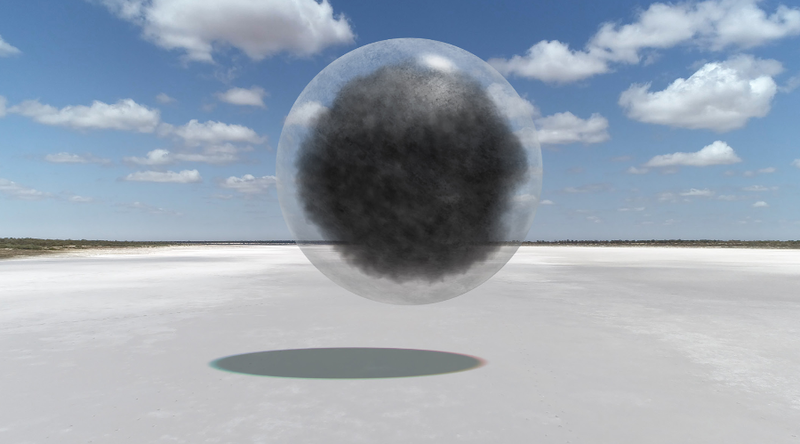 Commissioned by the 21st Biennale of Sydney (2018) and its curator Mami Kataoka, Chief Curator of the Mori Art Museum of Tokyo, the film was shot in November 2017 in the Australian desert of the Northern Territory using a camera that reproduces the electromagnetic radiation of these sacred lands. Produced in complex conditions of access, in concertation with the Warlurkbrunlangu Artists Aboriginal Corporation and in close collaboration with the aboriginal community of Yuendumu and its ‘traditional owners’, the film was shot at four sites that are usually closed to the public. Thermic and hyperspectral cameras as well as drones were used in the making of this futuristic anthropology. The film’s viewpoint focuses on certain dimensions of the territory imagined as an ‘acting presence’ by those who live in it. This reversal coincides with the revolution that Eduardo Kohn recently undertook by situating his approach, no longer among humans, but among the thinking forests. A reflection of this layering of hidden narratives and scientific experimentations, the title OttO postulates a dual reference. It evokes the first name of the ‘traditional owner’ OttO Jungarrayi Sims, whose silhouette appears in the film and who granted access to the sites according to aboriginal protocol. It also relates to Winfried Otto Schumann (1888–1974), a German physicist who in the 1950s predicted the existence of resonance frequencies in the Earth’s electromagnetic field. These so-called Schumann resonances, measured only a decade later, represent for the artist the possibility of scientifically transcribing a certain sacredness. 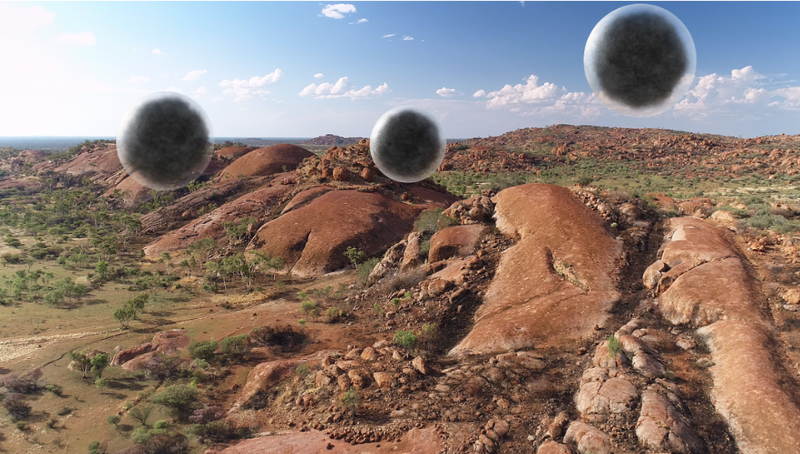 between cutting-edge video technology and a narrative cartography that is imperceptible to the non-initiated and that offers a voyage in time marked by immaterial presences, by myths and energies emanating from the aboriginal ground. © Laurent Grasso / ADAGP Paris, 2018. Courtesy of the artist & Perrotin. Laurent Grasso lives and works in Paris (France) and New York (USA). Sydney (Australia, 2018), the Gwangju Biennale (South Korea, 2012), Manifesta 8 (Cartagena, Murcia, Spain, 2010), the Sharjah Biennale in United Arab Emirates (2009), the Moscow Biennale (2009), the Lyon Biennale (2007), Busan Biennale, South Korea (2006 and 2004). Light neon (2008), installation on the pedestrian footbridge of the Hunter College in New York, Lexington Avenue. His work is the object of several important monographs : Paramuseum (Silvana Editoriale/Palais Fesch, 2016), Soleil Double (Dilecta/Perrotin, 2015), Uraniborg (Flammarion/Jeu de Paume, 2012),The Black-Body Radiation (les presses du réel, 2009).